As a founder, you ooze optimism. It’s a necessary coping mechanism to deal with the volatile up’s and down’s of creating something out of nothing. But that becomes problematic when you’re still finding product/market fit as it makes you believe that next feature will be the feature that solves all of your product’s problems. It won’t. Andrew Chen calls this the Next Feature Fallacy. Above is a chart of our Monthly Recurring Revenue since the beginning of Baremetrics’ existence nearly three years ago along with annotations of each feature release. I’ve overlaid vertical lines so you can see the exact points where those annotations correlate with the graph…which is almost meaningless because, as you see, those lines never directly correlate to a change in the graph. Features don’t grow businesses. Solutions grow businesses. If you throw a trend line over the graph, it’s just the most boring thing you’ve ever seen. Revenue continues to increase month-over-month, but there’s no single point where “everything changed”. That’s not to say features don’t matter, but progress isn’t made by shipping features, it’s made by solving problems. 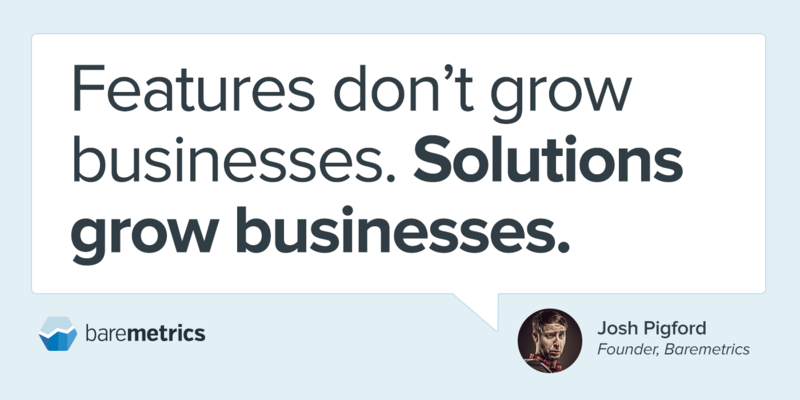 Like I said, solutions grow businesses, and ultimately solutions are the sum of all parts: features, marketing, onboarding, customer support…the whole bag. If you’re a designer or developer by trade, it’s easy to think that spending a couple of hours/days/weeks building something will be what turns your business around. It’s dangerous because it feels like progress. You’re doing something, right? But you’re likely ignoring the core issues if you’re just cranking out feature after feature while neglecting other parts of your business. Business is a never-ending process of tweaking hundreds of knobs. Many of the “wins” you’ll see will come from a random combination of knob-tweaking that you just stumble upon. Don’t just tweak “product” knobs. Make adjustments across every facet of your business so the entire customer experience is improved. That’s when you’ll find long term, sustained growth.